On a cool, windy, damp day in Cardiff, England beat New Zealand by a massive 87 runs after dismissing the antipodeans with 33 balls remaining. This result means that England are the first team to qualify for the semi finals, and will also finish at the top of Group A. This is because the first tiebreaker after points is games won, and whilst Australia could potentially match England’s 4 points they couldn’t match their 2 wins. New Zealand won the toss and chose to field first, perhaps thinking that showers would shorten the game and give an advantage to batting second. The game started cagily, with New Zealand bowling tightly to restrict England’s openers, eventually forcing Jason Roy to take some risks to get the strike rate up. Unfortunately he isn’t in great form and was bowled behind his legs after stepping too far into the off side. From this point to the end of the match followed a very simple pattern: England would score roughly a run a ball, and New Zealand would take regular wickets which stopped England gaining any momentum or accelerating. Fifties from Hales, Root and Buttler helped England reach 310, typically a pretty high target, but somehow it seemed a touch below par. In the previous game against Bangladesh Jake Ball conceded 81 runs and took 1 wicket, and several people (myself included) wanted him out of the side. Instead he opened the bowling and managed to bowl Ronchi on his fourth ball. This brought in world-class batsman Kane Williamson, who with Martin Guptill and Ross Taylor built a solid foundation for the New Zealand innings and dealt well with a slightly slow pitch, strong winds and a few instances of uneven bounce. After 30 overs, New Zealand were 156/2 and seemingly cruising towards England’s total. It took a cross-seam delivery from Wood which reared up on Williamson and glanced off his glove to dismiss New Zealand’s talisman. From that point, England’s bowlers took a firm grip on the game and never let go. Bowling with impressive economy, the bowlers forced New Zealand’s batsmen to play increasingly risky shots just to keep up with the required run rate. New Zealand finished 87 runs short of their target after their tail collapsed playing big shots with little success. The notable thing about the second innings for England was that there wasn’t a single weak link in their bowling unit, something which we probably haven’t seen in a while. Each of the 5 bowlers used took at least one wicket, had an economy rate below 6.00 and gave Eoin Morgan no reason to call on either Moeen Ali or Joe Root. In the first time for a few years, I would say that England’s bowling was better than their batting. Jake Ball won Man Of The Match, but the other 4 bowlers had almost equal claims to the title. With England topping the group, they can potentially rest players in their game against Australia at Edgbaston on Saturday and keep them fresh for their semi final in Cardiff on Wednesday 14th. Alternatively they might not want to disrupt a winning side, which is certainly what New Zealand and Bangladesh will hope for as their future in the competition relies on Australia not winning their final group game. England’s bowling performance in this game will certainly worry the other teams, because if their bowling becomes as strong as their batting has been over the past two years then England might be virtually unbeatable. On a sidenote, New Zealand finished bowling in the first innings 28 minutes after they were supposed to. This was very close to the 4 hours Sri Lanka took to bowl against South Africa, an over rate which saw Sri Lanka’s stand-in captain Upul Tharanga summarily suspended for two games. Several people have commented that Kane Williamson was lucky to escape a similar punishment, as he was given a fine and warning, and it certainly seems to show that banning a captain has not acted as a deterrent for other teams. Hopefully the ICC or MCC will look at other ways of guaranteeing innings finish on time in the future. In part 1 of the World View I looked at the fortunes of the three teams up there with England at the top of the World Rankings. In this part I’ll be looking at those in the mid-division and having a peek at their future series and where they might be going in the next year. This, I must stress, relates to test matches, not other international cricket. It was also written earlier this week, before the conclusion of the South Africa v New Zealand test. Hope you enjoy it. The Proteas were the top dogs of test cricket for quite a while (since 2012?) without ever seeming to have that aura of a dominant team. That was amusing because whichever way you looked at it, the 2-0 win in England to take the top slot was mightily impressive. It is hard to fathom that England have ever been more soundly beaten in a test match at home as they were at The Oval in 2012. South Africa’s reign at the top was assisted by the fact they rarely lost away from home, so that when they did lose at home, as they did to Australia in 2014, the away wins kept them top (along with the inconsistency of all the other nations). The South Africans fortunes have waned recently, culminating in a horror winter of 2015/16 when they lost at home to England and were thrashed in India on what one might call some interesting surfaces. As they did so their cracks became clear. The first is at the top of the order. Walking into an England series with Elgar and Van Zyl looked like it was asking for trouble. Elgar is a solid citizen, and played well for a century in Durban, but he’s no Smith or Gibbs. Van Zyl was a middle order test player stuck up the order and did not produce. The middle order solidity of Amla, Du PLessis and DeVilliers let them down in the two series, and when that was breached, problems in other areas got exposes. DeVilliers in particular is sending out warning signals about his workload that some Saffer fans are not too happy about. DuPlessis did not score as heavily and his average dropped down to the low 40s. Amla cannot go on forever. Cook coming into the top order (some saying long after he should have been) added some strength and Bavuma has a lot of promise, but this doesn’t strike you as World Number One batting. What they seriously must hope is that Quentin de Kock is going to work as an opener. He’s great to watch in the one day matches and the South Africans would love to see him do that for them. He’s opened in this recent match, made an 80, but you suspect this is a Hales like experiment. Probably doomed to fail. Where the cracks are really showing is in the Proteas’ main strength; their seam bowling attack. They simply can’t get their top four pacemen fit at the same time. Imagine an attack of Steyn, Morkel, Rabada and Philander in England next Summer? That is all we will do because Steyn is breaking down more than a 40 year old Trabant, Morkel is rickety, Philander has been out for quite a while and only just back, and Rabada is shouldering a large workload. South Africa have little spin threat, although Dane Piedt isn’t bad, but that’s something they are used to. The bowling just below test level is unproven – as it is most everywhere – but this doesn’t seem to be at the depth of England’s for example. South Africa’s winter is a bitty one. They play this series against New Zealand, and look like they might win the test at Centurion, then play a five game ODI series against Australia at home. They then travel to Australia for a three test series in Perth, Hobart and then a day-nighter at Adelaide. Given Australia’s recent travails in Sri Lanka, that looks a potentially exciting series. Sri Lanka visit South Africa for three tests starting at Port Elizabeth on Boxing Day (followed by Cape Town and Johannesburg).and then a whole host of limited overs bilge. Then South Africa jet off for a series in New Zealand, playing copious amounts of ODIs before settling in to a three test series starting in early March in Dunedin – the other two matches are at Wellington and Hamilton. With that workload their chances to get to England with the four pace bowlers intact looks limited. 11 test matches I make it, and bundles of hit and giggle. Those people sniping at AB for the workload comments (and yes, that is rich when you make the IPL your be all and end all) may need to revisit it. South Africa are at the crossroads, like so many, with younger players not really establishing themselves in blocks, but with enough green shoots to be tantalising for the future. They need to eke out as much as they can from AB and Amla before they ride off into the sunset. That may not be far away. The legends are bowing out, one by one. Holes in the test team need to be filled. By common consent, from what you read, the authorities running the game in Sri Lanka are beyond the ECB in ridiculousness. There are perennial financial crises. The nation that brought us Murali, Vaas, Kumar, Mahela, Sanath, Aravinda et al looked firmly on the downslope of their test match fortunes. They seemed the poster children for the travails of the test game worldwide. They played a frankly miserable series in early summer England (and I use the word summer with due poetic licence) where they lost 2-0, may well have lost the final one but for rain, and all seemed doom and gloom. Then Australia visited Sri Lanka and all hell broke loose. Suddenly, a month later, they had whitewashed the supposed World Numbe One team (and when have we ever seen a number one team thrashed like that in Asia. That never happens) despite batting weaknessess that have been opened up wherever they go. The reasons for the Sri Lankan demise, if that is what it is, is that maybe in this modern era of test cricket, having oven ready longform players is not going to be the norm. These players are going to take time to adjust, to gel, to form decent careers. In many ways this means selectors and senior pros are going to need to take time and not a little skill to identify who the top prospects are. Sometimes they will thrill you, play the innings of their life and give you a glimpse of their ceiling, but that is just what it is, a glimpse. We’re not talking about a James Vince cover drive in a dashing 30, but a matchwinning, Mark Butcher 173-esque zone of a lifetime knock. A Chandimal. A Kusal Mendis. A Dananjaya De Silva. For Chandimal, who also keeps wicket, that’s not such an issue, but Kusal and Dananjaya have given us a tempting look at the future. All around there is uncertainy, save for the trojan captain Angelo Mathews, who can’t go on forever. The fleeting sights of a Karunaratne ton are outweighed by maddening inconsistency. Kaushal Silva shows flashes of brilliance. There seems no shortage of those flashing lights, but they aren’t as world savvy as their predecessors, and aren’t coming into a team protected by the genius bowling of Murali. And while Herath is a lovely bowler, a joy to watch, and of full of width as your author (actually, I wish), he isn’t Murali and we can never hope to see another. That 3-0 win was a shot in the arm for test cricket. In each test they won the scraps. When it got tight, they got out of it. In each match they exposed the visitors’ weaknesses and held sway. In doing so they threw Australia into crisis. The spin bowling was brilliant, and although the seam bowling, despite Sanath’s cries, is not the best in the world, it has enough going for it. Will it be worldly wise enough to carry them through the next few years? Only time will tell. But watching Sri Lanka will be fascinating going forward. I think they are the bellwether for tests (along with the West Indies). When Sri Lanka’s production line is strong, then there’s warmth in my heart for tests. This winter Sri Lanka seem to have no test cricket until December when they travel to South Africa for the three tests mentioned above. They outstrip England for a stupid tour (our’s to the West Indies for 3 ODIs) with one to Australia for three T20 internationals in February. And that is it. There is nothing on Cricinfo suggesting they will be going anywhere else. Are they going to Zimbabwe? Their future tour programme shows a massive blank up until five tests at home after the Champions Trophy (2 v Zimbabwe, yeah right, and 3 v India). So how can you develop with a patchy program like this? So those that shout from the rooftops that Sri Lanka’s win against Australia vindicates test cricket, should look at the bigger picture and wonder why they are spread so thin this winter? Sri Lanka are one of those teams to nurture, not shun. We won’t be any further forward in knowing what we have in 9 months. Staying strong in South Africa would be an achievement, and then…. we may have quite a wait. With those two series defeats, home and away, against Australia, together with the retirement of their talisman, Brendon McCullum, it really looks like an end of an era for New Zealand. Such as it was. The most patronised of international cricket teams might still be ultra competitive in the shorter forms with their explosive, brutal batting, but in tests the flaws are too great for them to march forward, and you don’t sense a production line of Kane Williamsons are there to keep them afloat. The upcoming winter, if you include this series, sees New Zealand play 12 test matches, which is a considerable number compared to recent years and probably going to test them well. Two in South Africa, (well one given what happened in Durban) is followed by a series in India with three tests (see India section in previous post for venues). Then New Zealand host Pakistan in a two test series, have South Africa at home in three, and according to the FTP, Bangladesh visit as well with two tests in Wellington and Christchurch in January. Of course, as English-centric as we are, we can only refer back to the last series between our two teams as a marker. Some have claimed it to be the most important series of test cricket played in recent years, which is lachrymose nonsense. It was a two test series contested between two evenly matched teams, and the cricket reached very good quality at times. It produced excellent performances, and it also contained some absolute nonsense (Day 4 at Headingley again…). The key message should have been that a two test abomination at the start of a summer treated a good team with contempt. Instead it was Stokes and Cook. So what do we have with New Zealand now? In common with pretty much all test teams (India aside?) there are problems with openers. Latham and Guptill don’t seem to be that secure but they don’t appear as though they are going to be left out. The replacement is Rutherford, I presume. The next two batsmen are plenty solid enough – Kane Williamson is in the top echelon of players, and as I write he’s the only one not falling apart against South Africa. Ross Taylor has had some top innings in the past year, and is a major player. After that we have promising players, unproven players and insecurity. That is except BJ Watling, who is one of the most unsung cricketers I’ve ever seen. I’m a huge fan, and it is always a sense of consternation to me that his innings at Headingley is hardly ever mentioned. He’s a total pest to shake off when he is in. Then there is the bowling. Trent Boult and Tim Southee are a good opening pair, and there is back up in the seam department with Wagner, Bracewell, Henry and Milne. The spin bowling is taken care of by Santner at the moment, but like many others, the lack of mystery spin, or even a Swann-type hinders many teams these days. New Zealand are no exception. Will we have any more idea where New Zealand will be in the next 12 months? There is a feeling of a slightly managed decline, with the odd top performance being countered by continued problems against foes they struggle against. Pakistan at home for two games, and South Africa for three look to set the tone for the next couple of years. The Final Part will be around in a week or so, dealing with West Indies, Bangladesh and England. Zimbabwe? Why bother? Who knows when they play? You know I love a good anniversary, and you also know I love my nostalgia. So while Sky make a very decent and informative programme about England in the 90s, which, of course, coincided with Sky covering cricket, some of us have some more than poignant memories of the 1980s, when, at times, England were, truly, awful. You might remember I did a series of pieces on the Blackwash in West Indies in 1986, and yes, I never did quite wrap it up but it does stand another view if you’ve not seen it. August signifies a less heralded low point, but a low point nonetheless. In the early part of that month England took on New Zealand at Trent Bridge in the second test of a three match series. The first, at Lord’s had been a bit of a dull bore, livened up only by Bruce French being sconed, and replaced, for a short while, as keeper by Bob Taylor. The test hardly got going. The second, though, was a different beast entirely. England had been without Ian Botham all summer after his admission to smoking some Moroccan Woodbines (that’s from Only Fools and Horses) and incurring the wrath of Denis Compton who wanted him banned for life. While Botham was a diminishing force anyway, the England team had not recovered from the annihilation in the Caribbean and had been easily defeated at home by India. David Gower was removed from the captaincy in favour of Mike Gatting, but the first test of the Middlesex man’s leadership regime was an annihilation at Leeds. Gatting made a massive ton at Edgbaston, but it looked like it wasn’t going to be enough until the weather ruined the final day of the third test when it looked more likely that India would win than the home team. Rain may have saved us from another clean sweep. England were in disarray, and yet there was just a blithe assumption that we would beat New Zealand. These were not your pushover Kiwis any more. Richard Hadlee was a brilliant, utterly brilliant bowler – the Jimmy Anderson of his era only, and you might disagree here, much better. Martin Crowe was coming to the fore, not quite the great he would become, but a decent old presence in the middle order. At opener was the sturdy John Wright, doughty, a fighter but bloody good on his day. Ian Smith was the keeper, decent with the gloves, a nuisance with the bat. They had beaten Australia in Australia the previous winter and were simply not to be underestimated, but it felt like we did. In that first test we gave a debut to Martyn Moxon, a consistent run-scorer at the top of the order for Yorkshire, and a man with a classical technique to match. Moxon had made a decent impression in the Lord’s test, making 74 in his first test innings. One run more than Joe Root made in his first innings in tests! Moxon was opening with Graham Gooch who had made the game safe in the second innings of the test with a score of 183. At three for England was Bill Athey, who at this point had not made an impression in tests, and seemed to be betwixt and between. It wasn’t until the following winter that he got a firm place in the team, and not until the next year he made his only test ton. He seemed made for test cricket, but seemed to be in the team due to a 142 not out he made in the second ODI (which I remember he avoided what looked a plumb LBW when he was near his hundred). At four was David Gower, not in great form, still getting over the captaincy, but still a class player on his day. Shame for England was he wasn’t having many of them. At five was captain Mike Gatting, He’d made that 180-odd at Edgbaston, but he’d not shown signs of turning the ship around, and with an Ashes winter coming up, panic was beginning to set in. Panic may have been induced by the presence of Derek Pringle at number 6. Now, we’re not fans of Degsy here, but he wasn’t a bad player. I think even Pringle might admit that number six was probably one, and more likely two places too high for him in a batting order. A man who made one test half century shouldn’t be that elevated, and that indicated issues. Number 7 for England was John Emburey, who was a more than useful spinner and handy lower order batsman, and at 8 was his Middlesex spin partner, Phil Edmonds. Both had survived from the previous year’s Ashes series, in their own ways. Note that England had no hesitation in playing two spinners at home in those days. Batting at nine was Glamorgan quickie Greg Thomas, who had an in and out career, which didn’t last too long at the international level. Number 10 was Bruce French, the keeper – and yes kiddywinks, we thought nothing of having a keeper batting at 10! Number 11 was Gladstone Small, the Warwickshire seam bowler, who whenever I saw him play at county level, looked a handy old bowler. But it took him some years to get in the team. He made his debut in this match, joining Thomas, who had made his debut in the Blackwash series, and the military medium of Pringle. Yikes. We had to hope it turned! The New Zealand team lined up as follows. John Wright opened with Bruce Edgar. That partnership had seemed to be in place for years! Both were doughty players, using that word again, but Wright just had that something extra. In at three was Jeff Crowe, who never seemed to make the scores required of him, but following him at four was his younger brother, the late, great Martin. In the foothills of his career, he’d shown his promise and played some crucial innings. He would become one of their greatest players in the fullness of time. Once the Crowes were out of the way there was Jeremy Coney, the skipper. A redoubtable player, a total annoyance, and a dibbly dobbly bowler of some awkwardness. Coney had a legendary relationship (or lack of) with his gun all rounder, Richard Hadlee, who batted at 7 (compare Hadlee, who made test tons batting 7, and Pringle batting 6 for England). In between Coney and Hadlee was Evan Gray, a spinner/batsman bits and pieces all rounder. Number 8 was John Bracewell, a spin bowler and handy lower order player (not giving much away to the uninitiated here!) and following him at 9 was Ian Smith (let it not be forgotten that in 1984, Smith had made a century against England, and here he was at 9!!!!). The number 10 was Derek Stirling and 11 was Willie Watson, two seam bowlers of honest toil, but limited repute. Jeremy Coney won the toss on a wicket that looked a little greener than the previous years strip. The Trent Bridge test in the 1985 Ashes was a festival of runs, as Gower made a huge hundred for England (166?) and Australia replied with a big total of their own thanks to tons by Wood and Ritchie. This strip, according to Wisden, was not that different, but whereas the previous year’s match had been played in glorious weather for much of the contest, the day, according to B&H was mainly cloudy and very windy. A sub-plot to this test was whether Graham Gooch would make himself available for the upcoming Ashes tour. Botham had missed the 1984/5 India tour, and while many came home from the West Indies the previous winter, missing tours was seen as a pretty drastic thing. Now, I must confess, although I know Gooch wasn’t there for the Ashes, I never really recalled why. Sidesplittin’ in the comments to a previous post said it was because he had had twins (he thought). B&H describes the decision as “hanging over English cricket like the Sword of Damocles”. Anyhow, Gooch began the test with an assault on Hadlee (18 off 18 balls) before the Kiwi, playing on his home county ground, trapped him LBW. Moxon, after his promising debut, was bowled shortly thereafter for 9 and England were 43 for 2. Bill Athey and David Gower took England to lunch, where the total had reached 102 – a really decent clip in any test, but bloody good in that era. It was described as one of England’s “rare shafts of light of the summer” according to B&H. Athey was dismissed for 55, with the score on 123, LBW to Watson, having played with “pleasing assurance if not total confidence”. Gower marched serenely on, showing the “effortless grace which makes him the most attractive of batsmen” until offering no shot to a ball from Evan Gray that turned sharply from outside off and been given LBW. 170 for 4 became 174 for 5 when Gatting was bowled through the gate by Hadlee, a dismissal B&H thought had “some sense of inevitability”. “The England captain had played an embarrassing shot” it moaned. Arron might have applauded. Did you write it, sir? Picture by Adrian Murrell – “enhanced using Snapseed”. 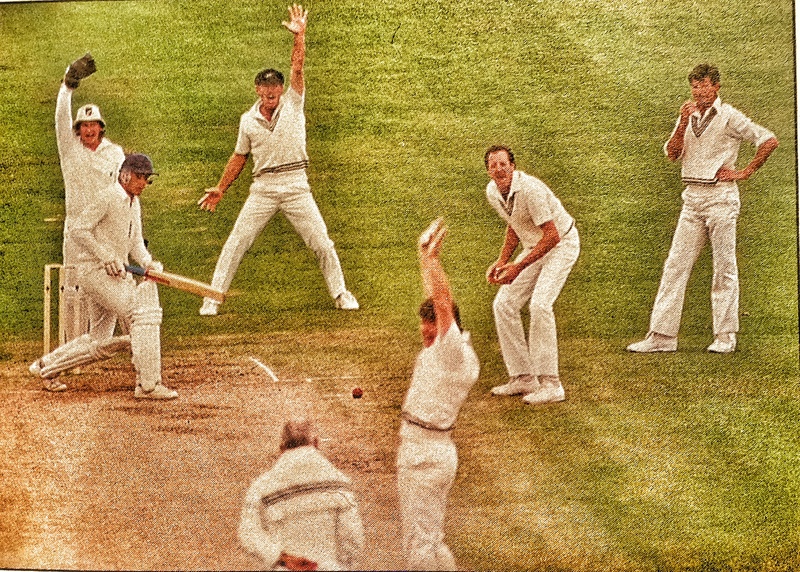 I think this is a wonderful snap, just for Richard Hadlee. Evan is giving it the two hands. Smiffy is directing traffic. Wright Jeff Crowe is Saturday Night Fever. Coney looks like he’s in need of the facilities. And then there is Hadlee… Fabulous picture. As he’s never read the blog, nor is likely to, he won’t comment on that. England’s innings meandered to the close, finishing 240 for 9. Thomas had played some “spirited shots” before falling to Hadlee. England added another 16 the following morning, with the aid of some dropped catches (B&H lamenting the slip fielding). The previous year 400 played 500, so this instinctively felt short of a decent total. he was always a whole-hearted tryer, a committed team man and a delightful guy. Australia’s discomfiture was increased by Small’s strange build: seemingly without a neck, he walked around as though he still had a coathanger inside his jacket. He came to England from Barbados just after his 14th birthday, the cut-off date for automatic qualification. However, the combination of his looks and his then-pair of nerdish specs made the Lord’s registration committee think he had no chance of ever playing Test cricket anyway, so they let him through. Anyway, we interrupt this message to ask, what did he have in common with Derek Randall, Les Taylor, Alastair Cook and Mike Gatting? Another pic from Adrian Murrell. Small captures his first test wicket, it says being Jeff Crowe, but the piece reckons Wright was his first victim. Quite hard to tell from here. Perhaps one of our New Zealand friends can make the definitive ID? Back to the test and at 92 for 3 England had got themselves back into the contest. Martin Crowe was joined at the crease by Jeremy Coney, and they set about rebuilding again. Having put on 50 for the 4th wicket, and with both looking untroubled (although Coney had been dropped at slip) “disaster struck in the last over before tea”. 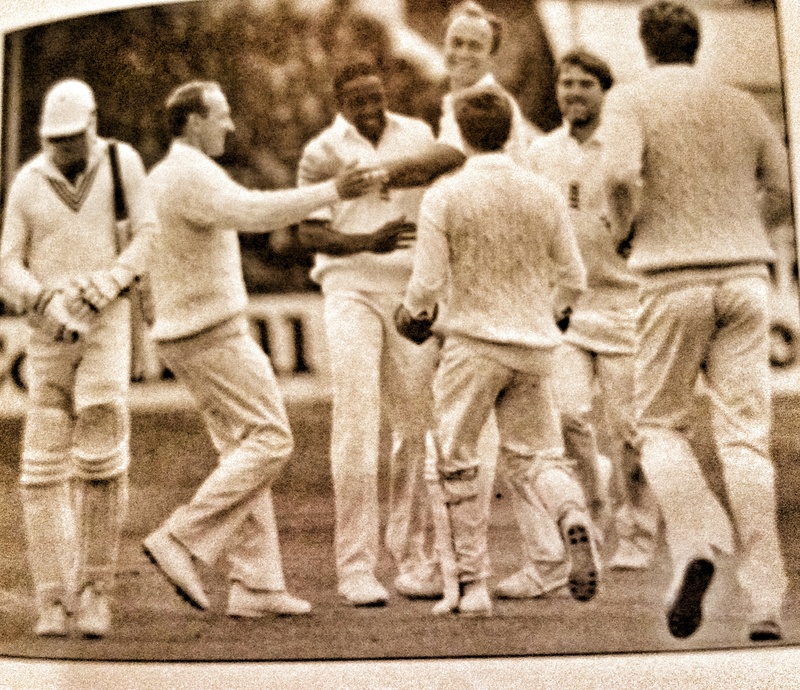 Martin Crowe called for what was in the view of B&H an “unwise short single” and Coney hesitated, before perishing. The wicket before tea looked worse when straight after the break Crowe turned Emburey into the hands of Phil Edmonds at backward square leg and New Zealand were 144 for 5, still 112 in arrears. However, the New Zealanders had a more formidable lower order, and it was now their time to shine…. New Zealand 303-2 (Williamson 92*, Guptill 70, Latham 59, Taylor 47*) trail England 389 (Root 98, Stokes 92, Buttler 67, Moeen Ali 58 – Boult 4/79, Henry 4/93) by 86 runs with 8 first innings wickets remaining. Dmitri doing the match update stuff today, so maybe this won’t be to everyone’s tastes! The events of the past 15 months have seen my attitude to cricket change considerably. I had been a truly passionate supporter of England, and while I always appreciated the great players around the world, I would get to dislike some of them based on the fact that they weren’t from my team. You can’t help who you are. Now, with the nonsense of the past 15 months, with no sign of any meaningful contrition, I watch the matches with a more neutral perspective. This time a couple of years ago the performances this evening of Ross Taylor and Kane Williamson would have driven me mad. Instead I watched as a man struggling with his body, and to some extent his game, in Ross Taylor battle gainfully, fighting hard, grafting. I love that in a player. Then there was the almost too perfect Kane Williamson, looking every part the true class batsman he is. It was almost inevitable he made runs, looking totally in tune with his game, and rarely, if ever, looking threatened. I’m preparing the next instalment of Century Watch for the inevitable… (that’ll curse him). It’s early days, I know, and this will be just two tests, but do you remember how, in the mid 2000s, every time Mohammed Yousuf came to the crease, you knew he’d score runs? I felt like that with Kane today. A lot of comment both here and on Twitter was focused on the Cook captaincy. It’s a default setting we have, that if things go wrong, it’s our beloved captain who is to blame. We knew what we were getting when we appointed him. Solid opening bat (at the time) with a penchant for run gluts, but also technically based, and vulnerable to flaws. The appointed vice-captain who had the label “not a natural captain” when he deputised for Strauss in Bangladesh. This is not a surprise, and I save my ire for Headingley Day 4 disasters rather than today. Those of us at The Oval in 2012 saw just how a pedstrian, out of sorts, bowling attack can struggle whoever is captain. Even his attempts at tactical changes, such as the leg trap and bowling round the wicket are almost by-the-numbers. I’m at the stage that having a pop at his captaincy isn’t worth it. He’ll have his days (Grenada Day 5 wasn’t just Jimmy Anderson) but he’ll have a lot of bad ones. This wasn’t in the same league as those that actually lose tests. The match is set up well. England’s score was brilliant considering we were 30-4, and I thought it was more competitive than it looks right now. I was watching the Brisbane test on the flight home on Tuesday and saw how smug we were to have bowled out the Aussies for 280 odd, because it was a flat deck and the tail had put the runs together. We know what happened next. This score looked better because we scored quickly and there was a view that the pitch has something in it. New Zealand batted well, some chances were missed (rare is the game where every chance is taken), and they are pouring it on. Yes, if Wood’s over-stepping hadn’t been caught, the day might have been different, but that’s the game. The perceived weakness in the Black Caps, the supposed flaky opening partnership, put on a really decent platform (admittedly, I was catching up with sleep for most of it – still suffering) and now everyone is worried about McCullum. I’d be more worried about the bloke who is 92 not out and has a big double to his name in the very recent past. For added reading today, have a laugh at Martin Samuel’s Daily Mail column – this is a football writer (and I despise him for that) trying to justify his varied sport portfolio and he spent yesterday bemoaning people going on and on about you know who, and wrote a whole column, it seemed, on you know who. I’m no fan of Newman, but when you have him and Lawrence Booth on your books, what’s the point of Samuel just showing up and writing this stuff? I’ve not read Selvey, so will go and look at it. I got a whiff of Simon and Smiffy at lunchtime on TMS, and FICJAM was in marvellous condescending form. I also had plenty of fuel to my anti-Lord’s fire with the constant looks at the spectators there today – I’m sorry, if you dress like that for a sporting event, there’s something up – and if you chucked, or allowed, a champagne cork on a football ground in this country you’d be banned for life (first for smuggling it in). Lastly, from Vian and I, many thanks for the visits and comments. It’s the 22nd of May and this blog has had more hits in a calendar month than any here on BOC, or HDWLIA. This is, of course, down to the new writer, who is now outshining me at every turn 🙂 . I’m going to get The Analyst to write a piece like this on him any day now. Seriously, it’s been brilliant how his style has been received here and I know he’s going down really well. It’ll be his turn tomorrow night/Sunday morning….. Cheers all, and looking forward to tomorrow’s play. I’m not one for previews, as I think the hype of these things gets too much. Too many people getting far too carried away, with silly press, silly angles and me being world class Mr Grumpy. I want New Zealand to win. It’s anti-big three, the Aussies need something like this in their own back yard to go spectacularly wrong (with apologies to my Aussie mates), and well, the Black Caps appear to be nice guys playing above themselves. But the Aussies are going to win. Just feel it in my bones. They needed to be got shot of before the Final for me, and they never really looked like being defeated in the knockout phase. Comments as and when. I’ll be on, I’m sure, in the morning. Good luck New Zealand. The first semi-final will send a new team to the World Cup Final. Will it be Dmitri’s tip for the championship, South Africa, or will it be everyone’s darling team, New Zealand. Needless to say, I have a job to hold down and need to sleep, so won’t be watching much. But you can comment away downstairs….